Your most valuable possession in life is your health. Unfortunately, this isn’t realized by most individuals until a sudden accident, onset of illness or death of a loved one occurs. Understanding your health is important, albeit complicated. You may hear or read health updates or cautionary tales from your doctor or online, but what does it all mean? The health profession is understandably complex, but all of the information you need is readily available through regular consultations with a health professional. Every 2 years, ask your doctor to check your blood pressure. 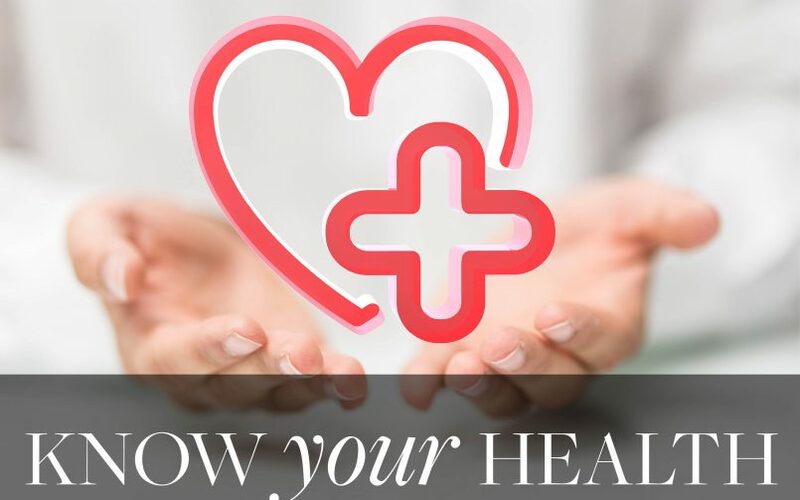 If you have higher blood pressure (top number between 120 and 139 or the bottom number between 80 and 89mm Hg) make sure to have it checked once per year. If your blood pressure is high, it can be linked to high cholesterol if the blood flow is constricted through your arteries. For adults ages 35 and older, schedule cholesterol checks along with blood pressure checks. If your cholesterol is too high, it builds up on the walls of your arteries, raising your risk of heart disease. By staying up-to-date on your cholesterol and blood pressure checks, you can minimize your risks for heart disease. Type 2 Diabetes is linked to both high blood pressure and high cholesterol. Your doctor will check for high blood sugar, but even with normal levels of sugar, Type 2 Diabetes can be diagnosed through cholesterol checks. This is because diabetes can cause narrowing of the arteries, causing a spike in blood pressure and similar issues to high cholesterol. For this reason, if your blood pressure is above 135/80mm Hg, your doctor may test you for diabetes. For those of you under 50, you should be screened for colon cancer if it runs in your family history. You should also consider being screened if you have inflammatory bowel disease. Visit your dentist at least once per year for a dental exam and hygiene appointment. If you’re between 40 and 54, visit your eye doctor for an eye exam once every 2 to 4 years. If you’re between 55 and 64, go every 1 to 3 years. These rules of course exclude those who have vision problems or a risk of glaucoma; for these cases, you need to consult your eye doctor and plan your visits accordingly. The vaccinations that your doctor recommends will be based on whether or not you have particular conditions (such as diabetes), but you should have a tetanus-diphtheria booster vaccination every 10 years. You may also receive the vaccination for shingles after the age of 60. Low body weight, smoking, heavy alcohol use or having a fracture after the age of 50 can call increase your risk for osteoporosis. If you are between 50 and 70 and have any of these risk factors, consult your doctor about screening for it. Be extra wary of osteoporosis if it runs in your family. Be open and honest with your doctor about your lifestyle. Provide accurate information regarding your history of depression, diet, exercise, tobacco and alcohol use. All of these topics can give your doctor valuable information regarding your risk levels for particular conditions. Regular visits to your chiropractor are also encouraged to minimize pain, increase body awareness and athletic performance, or prevent mobility issues as you age. Meet with your dermatologist regularly (1-2 times per year) to screen for any signs of skin cancer. Once you are age 50 and above, it’s time to begin discussing prostate cancer screenings with your doctor. Prostate exams are not performed on men with no symptoms; rather, your doctor will perform a Prostate-Specific Antigen (PSA) blood test. You should begin routine mammograms every 1 to 2 years beginning at age 40 to identify early signs of breast cancer. Because not all cancers are detected through mammograms, a clinical breast exam is suggested every 3 years for women ages 20 to 40 and yearly for women 40 and above. Knowing your health inside and out is a key part in achieving optimal health. Through regular consultations with various health professionals (including chiropractic!) you can prevent disease and fully enjoy your life.